The pace of change in Kubernetes can make it hard to keep up. Let's learn how to log containers with Fluentd and Logz.io. Kubernetes is developing so rapidly that it has become challenging to stay up to date with the latest changes (Heapster has been deprecated!). The ecosystem around Kubernetes has exploded with new integrations developed by the community, and the field of logging and monitoring is one such example. 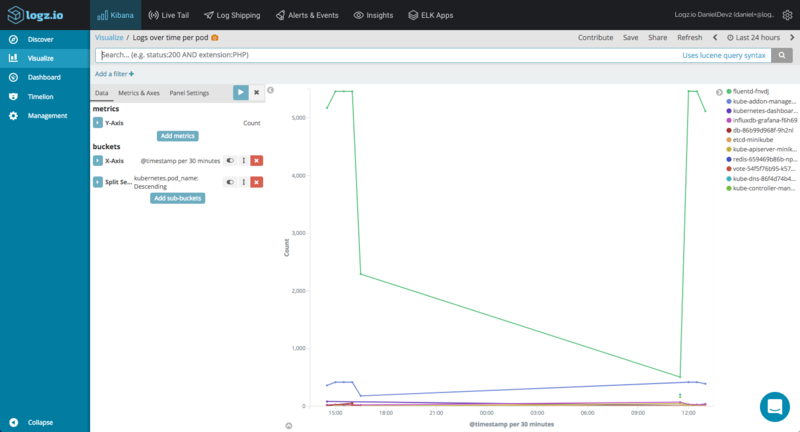 The topic of logging containers orchestrated by Kubernetes with the ELK Stack has already been written about extensively both on the Logz.io blog and elsewhere. The most common approach we're seeing now is hooking up Kubernetes with what is increasingly being referred to as the EFK Stack — Elasticsearch, Fluentd and Kibana. Deploying Fluentd as a daemonset, users can spin up a Fluentd pod for each node in their Kubernetes cluster with the correct configurations to forward data to their Elasticsearch deployment. 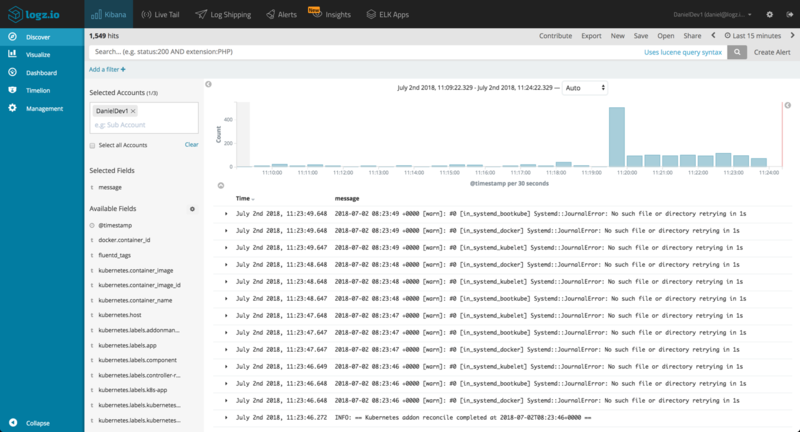 There are various daemonset configurations available but the one used here to send logs to Logz.io's ELK Stack is based on a daemonset configuration provided by the kind folks at Treasure Data — the company driving the development of Fluentd and Fluent Bit. We've added some basic parsing capabilities on top of this configuration, such as support for multi-line processing for exception stack traces (Java, JS, C#, Python, Go, Ruby, PHP) and parsing the log field as message. For those new to Kubernetes, steps 1-2 will help you with setting up the demo environment and are most likely superfluous for those with a running Kubernetes cluster. These steps describe setting up Minikube, kubectl, and deploying a basic demo app for generating some simple log data. Putting in place the logging infrastructure is described in subsequent steps. Minikube enables you to easily run Kubernetes locally as a single-node cluster inside a VM. Be sure to first install a hypervisor (I'm using VirtualBox). 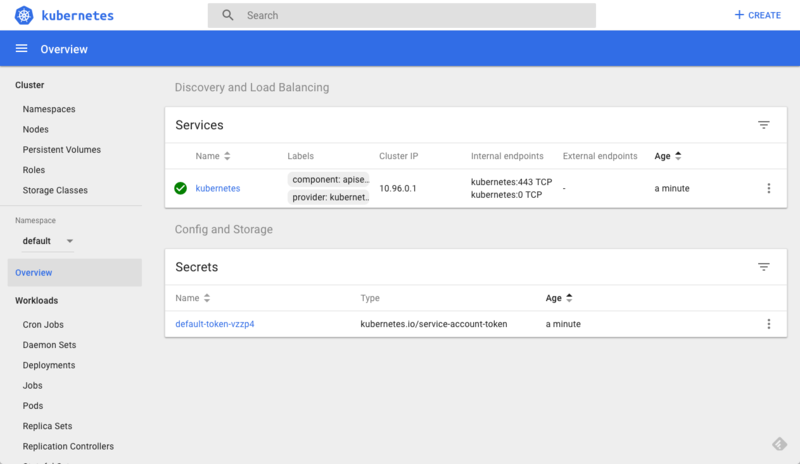 Our last step is to deploy the Minikube dashboard, a UI that allows you to easily deploy your apps to your Kubernetes cluster, troubleshoot it, and manage the cluster itself along with all the relevant resources. Let's start with deploying a basic demo application on our Kubernetes cluster. 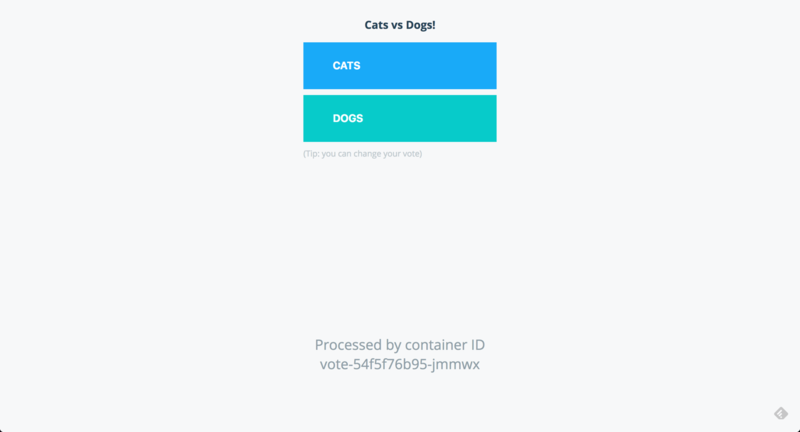 For this purpose, I'll use Docker's voting app, a basic app built of five services for handling online voting. As mentioned above, the method we're going to use for hooking up our development cluster with Logz.io involves deploying a Fluentd as a daemonset. A close look at the YAML reveals that with a few tweaks to the environment variables, the same daemonset can be used to ship logs to your own ELK deployment as well. value: "your logz.io account token"
As mentioned above, the image used by this daemonset knows how to handle exceptions for a variety of applications, but Fluentd is extremely flexible and can be configured to break up your log messages in any way and fashion you like depending on the type of logs being collected. Also worthy of note is that this Fluentd image adds useful Kubernetes metadata to the logs which can come in handy in larger environments consisting of multiple nodes and pods. 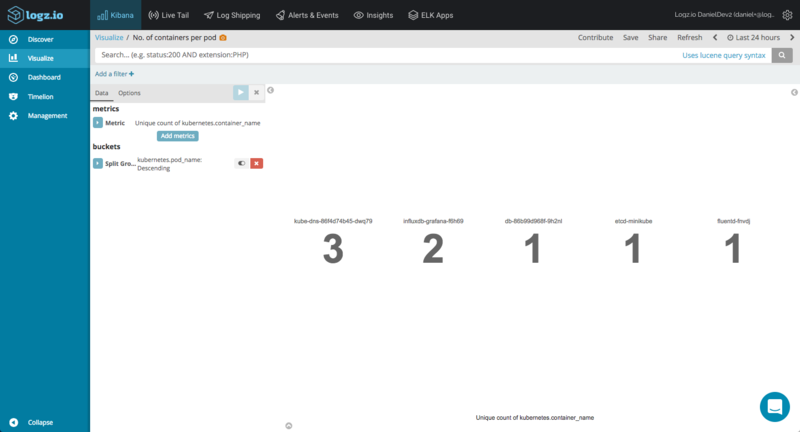 Below are a few examples of how you can leverage this metadata to gain visibility into your Kubernetes cluster with Kibana visualizations. Metric visualizations are simple and are great for displaying simple stats related to your setup. For example, you can use a unique count aggregation of the kubernetes.container_name field to see how many containers you've got running in each pod. You can do the same of course for the number of nodes running in your cluster. The EFK stack (Elasticsearch, Fluentd, and Kibana) is probably the most popular method for centrally logging Kubernetes deployments. In fact, many would consider it a de-facto standard. 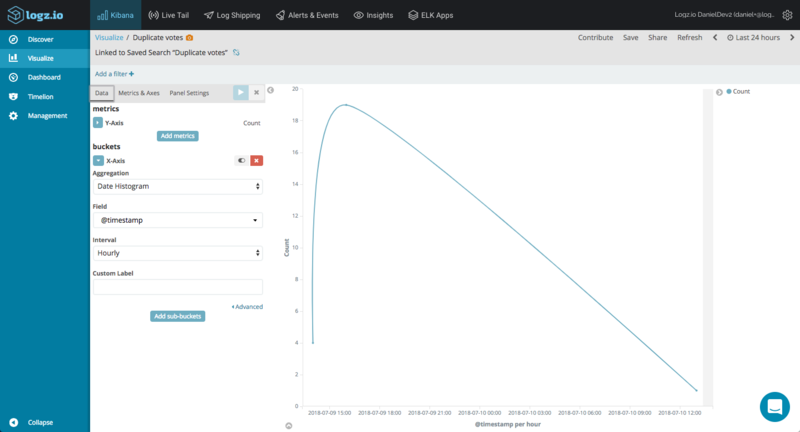 The combination of an easily deployable and versatile log aggregator, a high-performing data store and a rich visualization tool is a powerful solution. 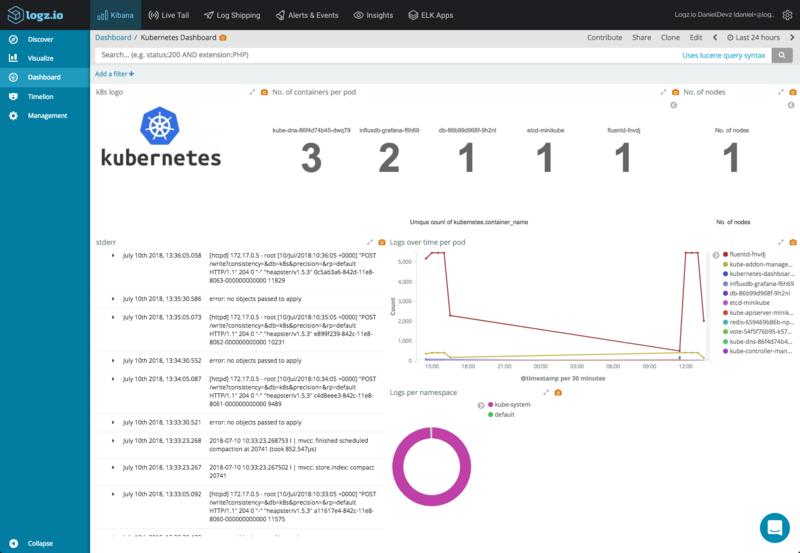 Of course, the log data generated by a single-node cluster deployed with Minikube on Mac does not do justice to the full potential of the stack - the visualizations above are simple examples and you can slice and dice your Kubernetes logs in any way you want. We are always looking to improve, so we'd love for you guys to try out this daemonset and give us your feedback .